I'm so excited for the release of this gorgeous new Camelia Carnation Collection. The carnation is one of my favorite flowers and it was so much fun creating this card with these beautiful flowers! Instructions: Score a 12” x 6” piece of white cardstock at 6” to create a 6” x 6” card base. Cut a piece of peachy pink paper from the Camelia Carnation Paper Collection, ink the edges with Coral Brilliance ink and adhere to the card base with dries clear adhesive. Cut another piece of designer paper for the inside, ink the edges and adhere. Cut a decorative border in white from the Fleur border basics die set, sponge with dries clear adhesive and sprinkle with crystal clear glitter. 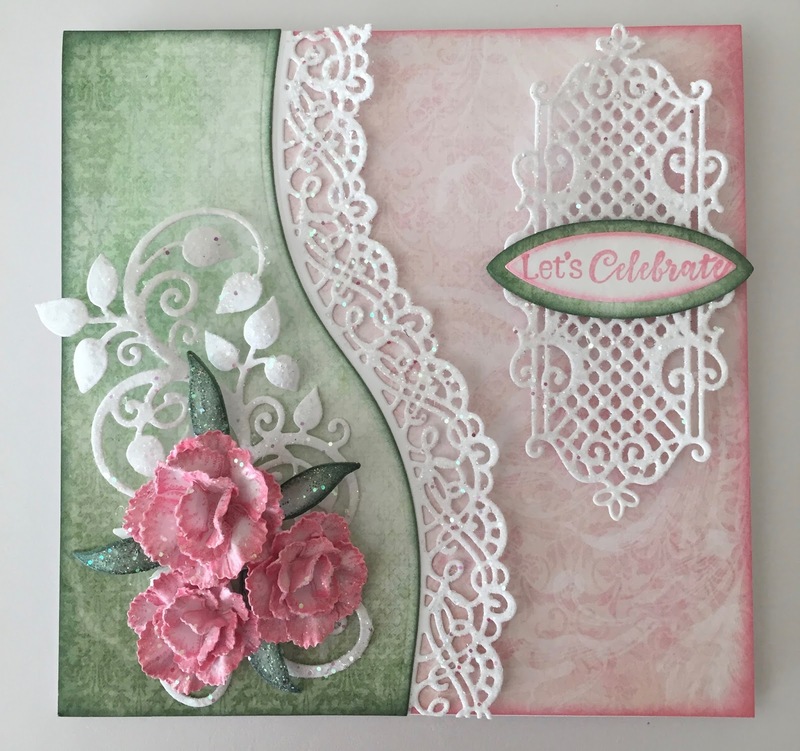 Cut a 3” x 6” piece of green paper from the collection, using the plain edge of the Fleur Border Basics die, cut a border to coordinate with the decorative border. Ink the edges with Mint ink. Adhere the decorative border to the green designer paper and adhere that to the card base. Cut the swirl die from the Cut Mat Create 2A die from white cardstock. Cut the decorative die from the Window Box Elements die from white cardstock. Sponge both with adhesive and sprinkle with Rajni Chawla’s Crystal Clear. Adhere to the card base as shown. Stamp the sentiment on white cardstock with Pearlescent Coral ink, diecut with the Small Oval die and ink the edges. Cut a piece of the green designer paper from the next size oval and ink the edges. Adhere the two ovals together and adhere to the Window Elements diecut. Stamp the flowers on white cardstock with Pearlescent Coral Ink, lightly color the edges with the same ink, place in the mold, spritz with water and run through the die cutting machine. See Emma Lou’s video to create the carnation. Stamp the leaves on white cardstock with Mint ColorBox ink, lightly color with Bamboo Leaves, ink the edges with Mint spritz with water and shape using the Deluxe Flower Shaping kit. Sponge the flowers and leaves with dries clear adhesive, sprinkle with Crystal Clear, and adhere to the card as shown. I love your white die cuts with the dark pink flowers! So gorgeous my friend! Another beautiful creation!! Love the flowers!